Borderline personality disorder (BPD) is characterized by unstable moods, negative self-image, dangerous impulsivity, and tumultuous relationships. Many people with BPD excel in academics and careers while revealing erratic, self-destructive, and sometimes violent behavior only to those with whom they are intimate. Others have trouble simply holding down a job or staying in school. Overcoming Borderline Personality Disorder is a compassionate and informative guide to understanding this profoundly unsettling--and widely misunderstood--mental illness, believed to affect approximately 6% of the general population. 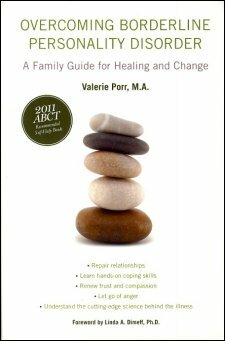 Rather than viewing people with BPD as manipulative opponents in a bitter struggle, or pitying them as emotional invalids, Valerie Porr cites cutting-edge science to show that BPD is a true neurobiological disorder and not, as many come to believe, a character flaw or the result of bad parenting. Porr then clearly and accessibly explains what BPD is, which therapies have proven effective, and how to rise above the weighty stigma associated with the disorder. Offering families and loved ones supportive guidance that both acknowledges the difficulties they face and shows how they can be overcome, Porr teaches empirically-supported and effective coping behaviors and interpersonal skills, such as new ways of talking about emotions, how to be aware of nonverbal communication, and validating difficult experiences. These skills are derived from Dialectical Behavior Therapy and Mentalization-based Therapy, two evidence-based treatments that have proven highly successful in reducing family conflict while increasing trust. Overcoming Borderline Personality Disorder is an empowering and hopeful resource for those who wish to gain better understanding of the BPD experience--and to make use of these insights in day-to-day family interactions.